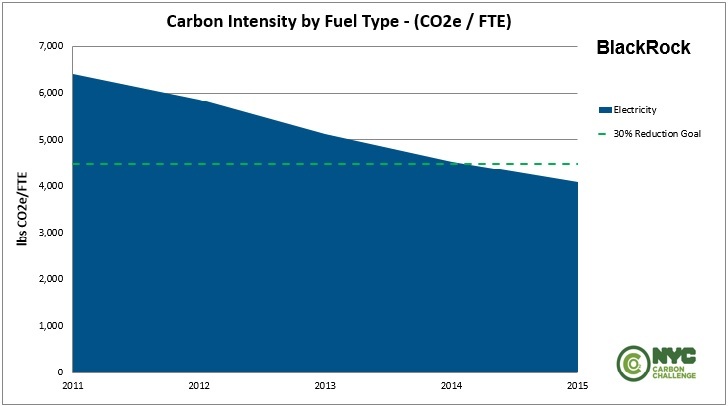 In 2013, BlackRock accepted the NYC Carbon Challenge, committing to reduce its greenhouse gas emissions intensity by 30% from 2011 levels. Over the course of five years, BlackRock achieved its goal by reducing its greenhouse gas emissions per fully-time employee intensity by 36.2%. In 2015, BlackRock partnered closely with the owner of 40 East 52nd Street, Rudin Management Company, to reduce the energy consumption of shared building systems within BlackRock’s office space at 40 East 52nd Street. The partnership was aimed at solving for the split incentive issue between BlackRock and their landlord, in which the building owner pays for an efficiency improvement but the tenant reaps the cost-savings. The two parties split the capital costs and cost savings of installing ten air handling units retrofitted with variable frequency drives (VFDs) and premium efficiency motors for all return and supply fans in the building. VFDs allow for more precision in air flow control, enhance tenant control and comfort, and allow the potential for demand response opportunities. The project is expected to reduce BlackRock’s electricity consumption by 850,000 kWh annually and yield an estimated $160,000 in annual cost savings. This successful collaborative effort has started discussions with BlackRock’s other major New York City landlord to initiate other joint energy efficiency opportunities in its other office building. Learn more about BlackRock’s sustainability initiatives .